Founded in the late 1980s, it played a crucial role in devising the country’s new conservation strategies after independence in 1990. It now cooperates with 55 out of the 84 conservancies in the Kunene and Zambezi regions, promoting community benefits from wildlife management. Over 1,000 local people are employed by these conservancies or conservancy-based enterprises. In the Kunene region alone, there are eight times more elephants than there were in 1980 as well as ten times more plains animals (springbok, mountain zebra, gemsbok and others). IRDNC collaborates closely with local communities to reduce the costs and increase the benefits of living with wildlife. It works to build skills and capacity, empower women and promote local ownership, rights and responsibilities. Diversified sources of income have come in the form of increased craftwork, sustainable meat production, plant cultivation and wildlife tourism. 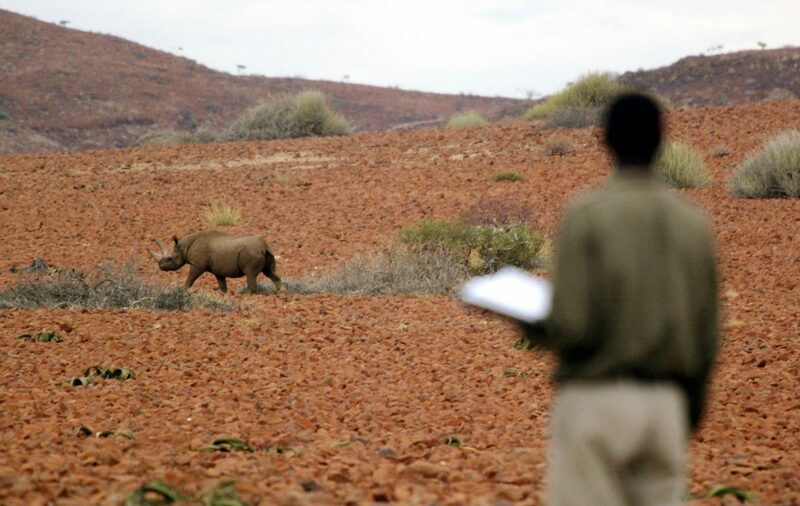 Tusk has supported IRNDC since 2016, when Garth Owen Smith was the winner of a Tusk Conservation Award, helping the organisation to strengthen existing community-based approaches to combating the widespread rise in rhino poaching across its conservancies. IRNDC is a conservation success story. But it continually faces new challenges, in particular the relentless rise in commercial poaching. It needs our support now more than ever.